When I haven’t had chance to go out and shoot I like to take a look back through my archives and see if there are any diamonds in rough which I missed the first time around. 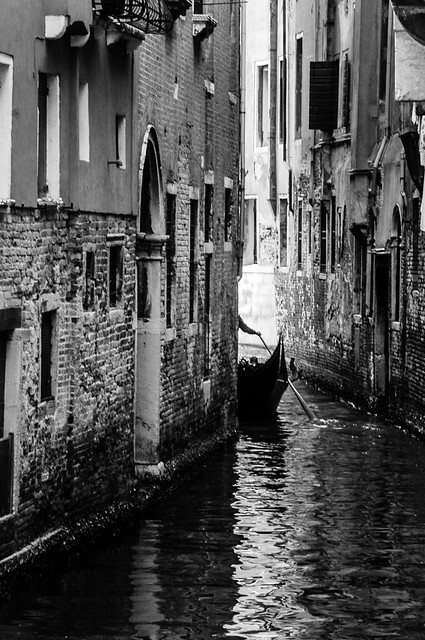 This time I decided to delve all the way back to 2012 and a trip I took to Venice. I was in a bit of a funk at that time. I was shooting with a big heavy Nikon DSLR with a dirty sensor and a not so great kit lens. I didn’t really know how to use a camera if I’m being honest. I just set it to full auto and shot whatever I liked. I did have some knowledge of framing and composition but using DoF effectively and choosing shutter speeds to freeze motion were beyond me. I never post processed any of my images and I only shot JPEG. I’d written off all my shots from this time as being snapshots but out of interest I thought I’d have a peek at the album to see if there was anything worth processing and looking back maybe I was too hard on myself. 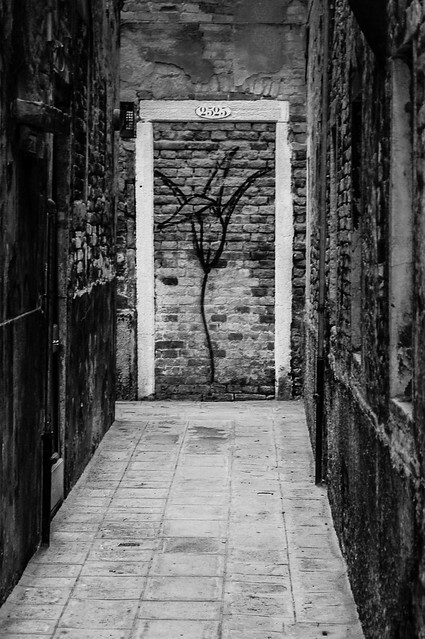 Street art in an alley in Venice. I think it is important to distance yourself somewhat from your photos. Eric Kim says, “kill your darlings”. By this he means that you should be critical of your own images, remove the emotional attachment you have to your photos and self edit. This is easier to do if you give yourself some distance from your images. A day, a week even longer maybe. This was much easier in the analogue days when you had to send off your roll of film and wait for them to return but in the instant age where you can see your image flashed up in the viewfinder or on the LCD instantly it can be tougher. I’d like to extend Eric’s philosophy further. Go back through your archives, look for those diamonds in the rough which you ignored. Is there a post processing technique you have learnt which can change this image? Let me know the results in the comments or on twitter. Always a good idea to look back, Rob. As you progress with your photography, looking back can always teach you a thing or two: how you could have improved the shot at the time of taking, and at the time of processing etc. You might also be surprised how some older shots now look even better than you first imagined. Nice read too! Thanks Keith! I was thinking of going back through my Flickr account and deleting all my sub-par images but a friend pointed out that it works as a kind of artist’s notebook, showing the journey you have traveled to get to where you are today. I might still cull some images but it is good to see how much I have improved or how, as you say, I would approach the same shot today.